The election of Barack Obama showed us all that it is possibly to rally a younger politically-interested crowd. All you have to do is show that you can create a substantial social media presence and tack on a few celebrity endorsements. 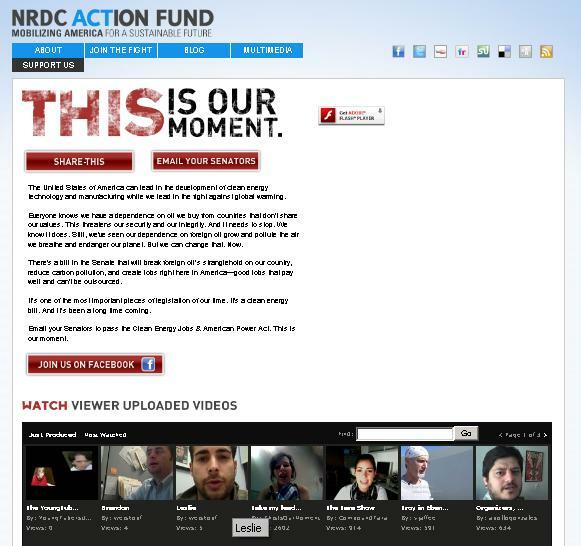 Recently, the Natural Resources Defense Council Action Fund took the same formula and created the “This Is Our Moment” campaign. The program took the best tactics used by the Obama campaign and has successfully driven a strong following through grassroots mobilization to help encourage senators to pass the Clean Energy Jobs & American Power Act. With the help of everyone’s favorite earth-friendly celebrity, Leonardo DiCaprio, and other well-known actors like Jason Long (the Mac), Jason Bateman (I miss Arrested Development), Emmy Rossum (the Phantom’s love interest), the NRDC rolled out an information-packed microsite, a series of web videos and an interactive blog. The site even has a customizable form letter that anyone can send to their senator, encouraging them to pass this bill. To support these core platforms, the campaign has maintained a Facebook page, Twitter account, YouTube channel and Flickr page, among others, to ensure news, information and its call to action was easily accessible. As for any grassroots campaign, an must-have function is the “SHARE” option. Through virtually any social media platform, users can pass along the information to their network with the click of a button. While may other politically-driven campaigns appear to be very one-sided and authoritative, this campaign boasts a communal database of user-generated content. Viewers can upload videos expressing their thoughts on the bill and relevant environmental issues. All of this content is then aggregated and shared on the homepage. Whether or not you support the cause (but come on, love mother earth! ), this campaign is a great case study for grassroots social media that has resonated with the (seemingly) politically apathetic youth.